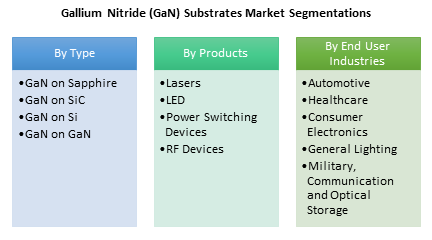 The global Gallium Nitride (GaN) substrate Market is estimated to surpass $5.18 billion mark by 2023 growing at an estimated CAGR of more than 8.95% during 2018 to 2023. The market is majorly driven by two important characteristics i.e. higher switching capacity and high temperature tolerance. In addition, wide band gap substrates are emerging as the suitable replacement for the conventional substrates because of its capability to enable small devices with higher performance efficiency. The wide band gap substrate not only improves the performance but also saves energy and cut down the losses. What is Gallium Nitride and Gallium Nitride Substrates? GaN is wide band gap material or banding material which possesses remarkable advantages over other semiconductor material such as Silicon, Silicon Carbide, Aluminum and others. The nitride devices such as light emitters, transistors, diodes are largely dependent on the hetero-epitaxial growth of GaN on foreign substrates such as Silicon, Silicon Carbide and Sapphire. The large part of GaN substrate market comprises of substrates and is moving towards adopting bulk GaN substrates. The basic design of bulk substrates is nearly similar to templates. The only difference is that GaN on GaN substrate have homo-substrate as the base whereas the templates have the GaN film over the foreign substrates. The GaN on Sapphire, GaN on SiC, GaN on Si holds the disadvantages of weaker performance because of certain factors such as structural defects to due to mismatch of lattice and thermal expansion coefficient and chemical incompatibility. What are the major applications for Gallium Nitride Substrates? The various end users assessed includes automotive, healthcare, general lighting, consumer electronics, military communication and optical storage and among others. LED, Laser and power electronic devices, and radio frequency are the major end users of GaN substrate and holds the tremendous opportunity in future. From 2014 onwards, more than 120 Millions of GaN LED were sold every year. This number was majorly driven by the lighting segment and is expected to dominate the market from short to long term. The GaN devices such as lasers are employed in healthcare industry for surgeries and treatments. The different types of treatment associated with healthcare are skin, dental, eye, cosmetic among others are performed with the help of lasers. In the automotive industry, GaN LED’s are employed into head lamps, welding systems, electric vehicle motor drive, and braking system. In addition, from near to medium term, adaptive lighting in automotive will witness significant traction because of its multiple functionality such as safety and creative interior lighting. Advancements in wafer production processes is the biggest opportunity that the major players in the industry are looking for to reduce the cost of GaN based electronics. SILTECTRA GmbH, has recently developed a laser based technology named as the “Cold Split” for reducing the wafer thickness to 100 microns within a very short duration and zero material wastage. This is expected to drive the adoption of GaN substrates. In addition, R&D related to cost reduction will thereby increase the flamboyancy in the market ecosystem towards achievement of low cost GaN devices. IQE plc, an epiwafer foundry and substrate manufacturer has set in motion the acquisition plan of Rare Earth Oxide (cREO) technology and IP portfolio from Translucent Inc., for $5m. cREO technology features an advanced approach for manufacturing a wide spectrum of semiconductor compound on silicon products including GaN-on-Si for power switching and RF electronics. Researchers have developed advanced gallium nitride (GaN)-on-silicon transistor technology optimizing the composition of the semiconductor layers with a high electron mobility transistor (HEMT) structure on a 200 mm silicon substrate with a process that will scale to larger industry-standard wafer sizes. Who are the Major Players in Gallium Nitride Substrates Market? The companies referred in the market research report includes Cree Inc., Kyocera Corporation, MonoCrystal, Sumco Corp, Sumitomo Electric Industries, Ltd, Hitachi Metals Ltd, Mitsubishi Chemical Corporation and more than 10 other companies.